Low maintenance, reversible, long-lasting, cost-effective, non-hormonal, can be used as emergency contraception. Doctor required to insert / remove, may be associated with more severe menstrual cramps and heavier periods, small risk of perforation and expulsion. The Copper IUD works by releasing very low levels of copper ions. Copper ions affect sperm motility, which means that the sperm struggle to move properly. Its secondary effect is to stop fertilised eggs from implanting in the uterine wall. One thing to be aware of is that Copper IUDs can potentially increase the likelihood of period cramps or increased bleeding, so if you already struggle with menstruation discuss this with your doctor before committing. Tip: Ensure that insertion and removal are as effective and painless as possible by going to a professional proceduralist for insertion of the Copper IUD. How do I use the Copper IUD? Step 1: Because the Copper IUD is a method of LARC, you don’t need to do anything except show up for the insertion and removal. 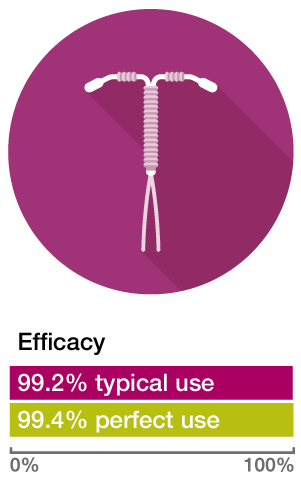 Step 2: Once the IUD is inside your uterus, you can forget about it for up to 10 years, before you need to replace it. Step 3: If you change your mind at any point during those 10 years, you can simply make an appointment to have it removed. Simple, right?